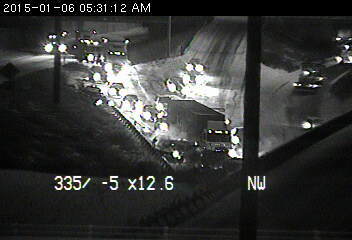 The Minnesota Department of Transportation has opened the ramp from southbound Hwy. 280 to eastbound I-94 following multi-car pileup that occurred early Tuesday on the snow and ice covered ramp. The busy ramp was closed just after 5:30 a.m. and reopened at 8:30 a.m. There were 14 vehicles involved in the mishap, said Lt. Tiffani Nielson of the State Patrol. Original estimates put the number at 20 vehicles. According to Nielson, one vehicle spun out on the ramp then the other vehicles, which included a semitrailer truck, slid into the first vehicle creating the pileup. Two people were taken to the hospital with minor injuries, she said. "Vehicles involved were driving too fast for conditions. Roadways were in poor condition and speeds should have been reduced," Nielson said. During the closure, traffic was diverted to westbound 94 and University Avenue. It was not immediately clear if there were any injuries, but ambulances were dispatched to the scene, according to MnDOT.